Most beautiful view in the Florida Keys! Enjoy breathtaking panoramic ocean views from our spacious and bright condominium. Relax on the balcony and enjoy the awesome view and ocean breeze while overlooking the fresh water swimming pool*, marina, beach and jetty. Each bedroom offers a luxury king bed with private access to a full bathroom with step-in shower. Bedroom amenities include a paddle fan and cable TV. All linens (bed & bath) are provided for your convenience. Note: a hairdryer is provided. The spacious living room is furnished with sofa, loveseat, and chair w/ottoman for plentiful seating. The TV/VCR/DVD (premium cable), AM/FM radio/CD/cassette provides relaxing entertainment after a busy day on the water. The newly remodeled and fully furnished kitchen is beautifully appointed with wood cabinets, granite countertops and stainless steel appliances. Dining area accommodates 4 with additional seating at the bar. The unit provides a private laundry room with full-size washer and dryer. Iron, ironing board, hair dryers, beach towels and extra linens are provided for your convenience. A well maintained private beach offers the perfect location for that ocean front cookout and/or picnic. Enjoy happy hour with a favorite beverage under one of the tiki huts then take a stroll down the jetty for an incredible view of the sunset. Enjoy a walk on a paved walking path around the private lagoon located on property. Swimming is also permitted in the lagoon with easy access from a sandy beach area. The clear lagoon is home to many tropical fish and an occasional tarpon or lobster may be spotted. Our primary residence is Cincinnati, Ohio where we have owned and continue to operate a full service insurance agency since 1975. A few hobbies we share include fishing, scuba diving, auto racing (particularly IndyCar), golfing and travel. Our love for offshore and backcountry fishing led us to make the Florida Keys our second home. This particular property offers direct Atlantic ocean access (no bridges) from a deep water marina. Adams Cut provides easy, quick access to the bay side. In addition to the fishing, the Keys offer awesome scuba and snorkeling opportunities for everyone from beginner to advanced. The relaxing atmosphere, friendly people and wonderful restaurants of the Florida Keys are a few other reasons to keep us coming back. There is no other place to compare! The best fishing and scuba diving in the world is found in the Florida Keys. The relaxed atmosphere keeps one from wanting to leave the Keys. Each island throughout the Keys provides fabulous restaurants, unique shopping and sightseeing. Enjoy! toilet, shower, luxury linens, hair dryer. Enjoy beautiful views of the Kawama Beach and jetty from the unit and balcony. Experience a magnificent panoramic view of the Atlantic Ocean. 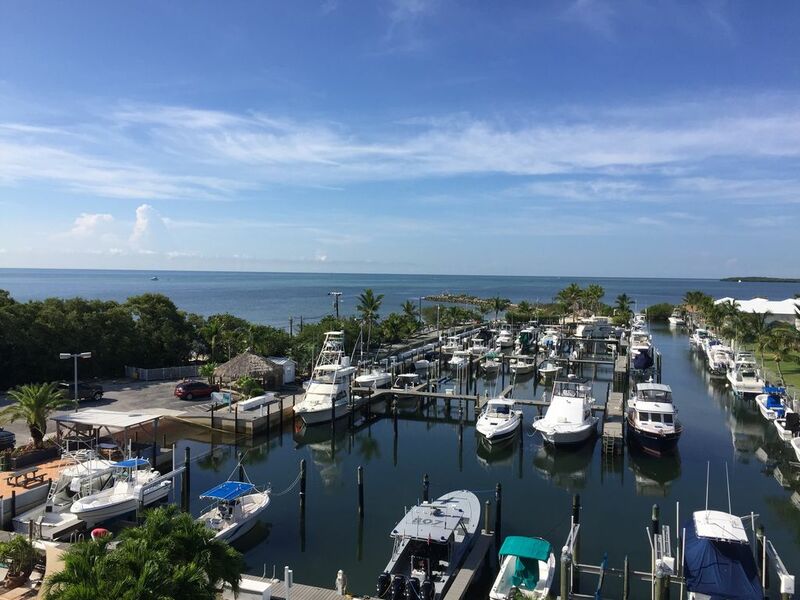 Kawama Yacht Club is situated on the Atlantic Ocean coast of Key Largo, Florida. Private laundry room at unit. Parking available at condo tower. Bath, kitchen and beach towels provided. Large open living area with seating for 8 people. Full kitchen. Stainless steel appliances, granite countertops. Dining table with 4 chairs. Kitchen counter/bar with 3 bar stools. Premium Xfinity cable package, movie channels, sports channels, etc. Panoramic ocean view overlooking swimming pool and marina. BBQ grills located at beach. Tiki huts located throughout community. Tower Oasis pool strictly for use by Tower owners and guests. North pool for use by all Kawama residents and guests. Fresh Water (heated) Swimming Pools, Tennis Courts (lighted), Beach, Children's Playground, Swimming Lake (oxygenated), Walking Paths, 24-hour Security, Elevators, Marina (limited service) with Deep-water Dockage, Water, Electric and Immediate Ocean Access, Fish Cleaning Station. This property was just as shown in the pictures. Very fresh and well maintained with nice furniture and linens! You can tell that the owners really take care of this home and keep it in very good shape. We loved the expansive views of the ocean and amenities in the area. Having a fully stocked kitchen was really nice during our stay! Lisa, the homeowner, was great at communicating with me and making sureness I knew exactly how to arrive at the property as well as everything that was available to us during our stay! We definitely hope to come back to this home in Key Largo! Thank you for the kind review. I am happy that you enjoyed your stay and look forward to having you return in the future. This condo is so comfortable and well appointed. There wasn't anything we needed for our week stay in Key Largo. Numerous restaurants within walking distance. Walk to the Pilot House for a painkiller, walk to the Key Largo Fisheries for a nice lunch, walk to Pinecrest Bakery for a café con leche and Cuban pastry. Everything in Key Largo is easily accessible with a stoplight on the Overseas Highway. The owners were very attentive and made sure we had everything we needed. The grounds are really nice and we especially enjoyed lounging by the saltwater lagoon and out front by the fishing jetty. The views of the Atlantic from the balcony and the Master suite can't be beat. We will definitely be back. Thank you so much for sharing your place with us. We stayed in the condo for Spring Break with our two boys (5 and 8). Pool is awesome, the ocean front area is great for renting a paddle-board (Paddle the FL Keys delivers! ), snorkeling and exploring during low tide pools. <1 mile away is Key Largo Fisheries - a GREAT place for picnic style eating or take-home cook your own FRESH seafood. Really close (but very private) location to grocery/other stores, restaurant and Pennecamp Park. My boyfriend, my teenaged son and I used this condo as our base for exploring the Keys during March Break, and it was great. The condo was even nicer than in the pictures - sparkling clean, airy and bright, with comfortable furniture and a well-equipped kitchen. It was an inviting place to stay if we were tired and just felt like hanging out, as well as a good location to explore the Keys and adjacent parks from. We enjoyed the pool as well, and the grounds and marina were lovely for walking and exploring. The owners were great to deal with, and even called the day after we arrived to make sure all was in order and to answer any questions we might have had. In all, we would certainly return, and would recommend this place to others. It is such a pleasure to hear from our guests and to know that they enjoyed their stay. We look forward to hearing from you again when your travels take you back to the Florida Keys. Thank you!! My husband and I were lucky to be able to stay at this condo in such a beautiful and relaxing location for a week. Our first visit to the Keys! Thanks so much to the Lisa for the thoughtful tips for great places to eat. We will definitely be back! It was a pleasure to meet you while you were at the condo. So often our correspondence is limited to phone conversations. We enjoyed the opportunity of actually meeting face to face. We are looking forward to your return! the owners were very helpful prior to our arrival. the condo is very wecomming spacious clean and tidy, situated in a excellent location for local amenities, just a short walk to the beech. it was very relaxing end to our Florida holiday. would recommend to family and friends hope to return soon!! Hello Adrian and Emma and thank you for the nice review. It was our pleasure to assist you with your travel needs and we look forward to your return. We will work on the fishing charter ahead of time for your next visit. Best regards, Lisa & Herb. If arrival date is within 60 days of the reservation, the Tenant agrees to pay the total amount within five days. Check-in time 4:00 PM. Check-out time 10:00 AM.